I’ve recently read many threads about DWPS motion being too flat and I feel like it needs to be dug up again to clear some misunderstandings I and some other guys there have. I’ve been trying to learn DWPS for a few months now, I’ve had a few lightbulb moments here and there, but nothing really big. So basically the question is: Can pure 903 wrist deviation really create an escaped upstroke or is there always at least just a little forearm rotation involved? Is my setup the only problem or may it be correct and pure deviation isn’t enough? I feel like adding a little rotation is the only way to escape upstrokes and then it’s neccessary to rotate to previous position to not make hand hit the guitar body on downstroke. Correct? to my eyes, on your first vid you have a dwps, yes…but then the motion isnt really following the pickslant. In other words a dwps by itself doesnt do much if the picking motion is still straight up and down parallel to the guitar body. Yes, that’s actually the main thing I’m pointing at. Both strokes are rest strokes. I’ve seen quite a few posts by people with similar problems there and even after reading them I still can’t fix that in my own playing. I can do fine 903 UWPS any time, with DWPS I can go to Friedman levels of supination and it’s still not enough. I assume there’s something wrong with my hand position. I assume there’s something wrong with my hand position. in your vids, the only time I see yourhand position really “supinated” is in the bottom vid when you have rotated away from the body and you have some air between the thumb and the body. I’m definitely flexing wrist a little when supinating but I’m still rotating my forearm out of the guitar. Thumb side of hand doesn’t contact the strings or the bridge. If I don’t flex a little, I pick air. Hitting tone pot and body on downstrokes is also a problem. A different angle so you can see the amount of supination/pronation. DWPS tremolo attempt, feels awkward and upstrokes are still stuck. I think when DWPS I’m using too much flexion on upstrokes and not enough radial deviation. Hmm, maybe this all only a mental thing. Maybe (really maybe, because I am far from being an expert) it could help, if you try to rethink what an upstroke is, when you perform it. An upstroke is a stroke that goes up, right? Obviously. BUT only when the string is the point of view. What I can see in your dwps-tremolo-attempt is, that you try to execute what is normally considered to be an upstroke and that leads to a flexion-movement of the wrist that causes the pick to be trapped after the upstroke again. This is the straight-pickup-parallel-motion that prevents an escaped upstroke (here in your case). But what happens if you abandon this string-pov and forget the idea of upstroke and downstroke and instead think of a SIDESTROKE - Left- and Rightstroke? So change to the wrist as your point of view? The pick travels then differently, the path is more diagonal like along the typical angled pickups some guitars have, like Strats for example. What happens? Does that feel smoother? Does the pick escape on upstr… sorry leftstokes? lately ive been noticing (and working on) how I manipulate my thumb and index finger as I go between uwps and dwps. on uwps the thumb and finger is a little straighter so they look slightly like a birds beak. On dwps they are both more bent so it looks more like the standard ‘D’ shape. At first it sucked and I sort of had to stop as I went from one slant to the other. Turns out i was sort of trying to use a different motion mechanic for the 2 different slants. But as I started understanding the changes in thumb and finger shapes, it started working more smoothly. Picking around the string: if you think about the string itself and the way it is round, when you are dwps you are sort of picking on the “bottom” of the string. if you look at the picture I posted above of Troy doing steep dwps, you can clearly see what i mean. He is almost “under” the string and if you put some paint on the upper edge of the string he would never touch the paint lol. So when i do my “picking around the string” exercise, I use the same motion mechanic (AFAIK!). The main thing that changes is that for uwps my thumb and fingers straighten out slightly and for dwps my thumb and finger bend a bit more. So you might try that exercise. first figure out where your “neutral” spot is where you are neither uwps or dwps. Get your tremolo going. Then WITHOUT changing your motion mechanic, find ways to go back and forth between uwps and dwps. To me, if you are actually picking “around” the string, then you will escape. If you are changing the angle of the pick BUT you are still dead neutral in the middle of the string then IMO you wont escape. I’m going to say something in a bit, but that is to me essentially twps on one string. Perhaps the circumference of the string idea(around the string) means that in fact there always are subtle rotations going on especially on string changes but even on one string passages since the string tension constantly change between frets and open string if in used in the passage. So not just three gears, subtle changes between the two extremes of what I like to call foward(dwps) and backward(uwps) pickslanting, it is perhaps reasonable to say that there is a neutral non slant somewhere in the rotation but the idea you brought up(which I had seen but not yet utilized), shows that is indeed a continuum. I had some ideas here I was going to try to write a new topic but this is just as good probably better. Dwps or forward pick slanting was almost impossible for me , especially on my nylon string elec/acoustic. The problem was I believe as you say, “how can you flatten your hand out enough to actually bury the pick into the string”. The pick was constantly trying to change the angle back to backward(uwps) pick slanting. I call it forward and backward for the position of the index finger and thumb. In forward slanting picking the index knuckle is rotated toward the middle finger knuckle(you can do it on your knee in the ideal) and the thumb is almost smooth(no bumb). After awhile the index finger can be rotated and held with tension underneath the middle finger without a pick in your hand. Backward pickslanting means your index rotates towards your thumb( a bump is very evident in the thumb knuckle). Even so this still doesn’t solve the problem doing it on a guitar string with all the tension involved as well as the topography of the strings, bridge and body. This is what I did to get it going(after not to long perhaps even hours), the motion will be really easy, but I will explain what the problem actually is after I give the solution. In the G&R video from '87 live from the Roxy the first number is fast and furious and watching Duff Mckegan play confirmed after the fact what I did in fact did do. He wears his bass way way down below his waist(this is a strictly pick side thing so fretting is not important at this point), so that his arm is straight or almost straight with neck close to his shoulder. This will not work sitting down and without a good long strap. This way the issue with flattening your hand is essentially eliminated. Pick a good clip say between 100 bpm and 110 or faster if you like(some music for inspiration), and try that for a while using your whole arm for the motion at first. It worked in one day for me on the lowest string. The next day it was pretty much done on all the strings with the highest string being the hardest and this is why. 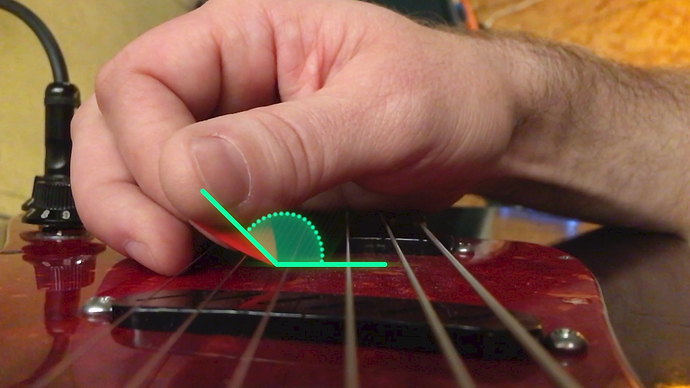 The pushing of the string away from center(forward) automatically(without a concerted effort), moves the hand into backward pick slanting(the index knuckle rotating towards the thumb and thumb rotates away thus creating the need for the so called “thumb bump” (seen in the Vinnie Moore CTC video on the soft drink lick), to keep the pick at the correct angle( tip pointing towards the bridge), otherwise the pick could slip out very easily, but in this position if you rotate the index and thumb toward the middle finger you have forward pick slanting. The reason why it is much easier to do this standing up with your full arm and the instrument way way down is because the motion can be repeated almost perfectly every time and so momentum can build up and you can “learn” it where it counts. The reason it is so hard to do this sitting down or with the instrument higher up on the body is because the pick wants turn towards the bridge so the hand can avoid the impact of the pick hitting the string. Naturally there are all kinds of solutions to this(keeping the pick point angled towards the bottom string side of the neck), put the middle finger over the index to hold the pick from leaving the angle, putting the middle finger behind the index touching the thumb but not a real two finger grip, the two finger grip(made famous by any number of players), three fingers(any kind of combination of placement), the second finger grip which is perfect for forward pick slanting(EVH), putting any combination of the three last fingers up against the palm(anything to maintain that forward slant while picking in and out repeatedly), and finally the the thumb index grip with the rest of the fingers free floating(the hardest btw). The flow of the movement must be really secure, otherwise you will miss the string and loose the fluidity. The important point is to make sure that the motion is pushing towards the neck on the in/downstroke and the upstroke takes care of itself, because the tendency is for the body to resist this motion in favor of backslanting/uwps which is why I think essentially uwps is a fudge. I tried but the calluses that had to develop on the underside of the thumb take way to long and the feeling of dwps once you get it is just feels way better(once you are secure the wrist takes over and your off- it’ a great way to palm mute). When one does picking in the air it seems so easy but this type of forward slanting picking motion in and out requires having to work(at first) hard to avoid the strings desire to resist the pressure against it, this where momentum helps tremendously don’t try it too slowly or you won’t create the situation in which the actually issues apply- it is a kind of weight training movement. I really like this way of picking and want to make it my goto in most situations, I’m sure you will get it. Btw the so called “escape” on the upstroke is so minuscule at fast speed that one has to be really careful about touting it’s effectiveness for string switching, there are definitely caveats. If this is of any use ask questions. I can’t really work out whether I’m using some rotation or not but somehow the motion is not parallel to the guitar body but diving into the strings on the downstroke and escaping on the upstroke. I’m sorry, but let’s get straight to the critical things here - more pics of that guitar at once! What a gorgeous top. I don’t have a device that takes decent photos, but you should be satisfied after googling “suhr guthrie govan bengal burst”, there’s plenty! I suspect what’s happening is that your movement isn’t “strict” 903 wrist movement, but is some shade toward a “902” movement, with slight wrist extension at the end of downstrokes, and slight wrist flexion at the beginning of upstrokes. The pinky gliding along the pickguard “pushes” your wrist off of the strict 903 axis as you move through a downstroke. 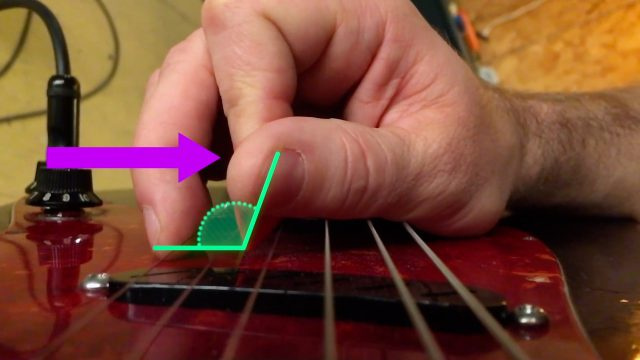 This is why your thumb can be closer to the guitar face at the end of a downstroke than the beginning of a downstroke, but your pinky remains at the same “height” above the guitar face both at the beginning of a downstroke and the end of a downstroke. In theory, you could accomplish the same thing through some sort of contortion of your palm or fingers, but that doesnt appear to be the case here. I guess the same result could also be accomplished with forearm rotation, but if there is any forearm rotation in your case, it’s very very subtle. @adamprzezdziecki , I don’t know if my interpretation of @shinjuku 's picking helps shed any light on your picking for you. I guess one way to look at it is that if you can’t find a way to get strict 903 movement to have escaped upstrokes, maybe experimenting with something more 902-ish will be more palatable to you than adding forearm rotation. Looking at @shinjuku as an example, I’d say the more supinated your forearm posture is, the more a 903 action will tend to have escaped upstrokes, but also the more problematic the “where does my pinky go if not through the face of the guitar?” question becomes, and @shinjuku 's video shows one solution: the pinky slides along the guitar face, and the overall movement takes on a bit more of a “902” character. Ha, no wonder. My main 7 is a Suhr Modern flame top in Bengal Burst. You have good taste. Trying 902 leads to stringhopping, upstroke is still not escaped so I’m subconsciously trying to add flextension to it and we all know bad things happen then. When I look at my dwps now I feel like the problem is whenever I try to play a little faster, flexion upstroke-extension downstroke starts to become main source of picking motion. Maybe I’ll try practicing slow to try get rid of that. Thanks for the analysis Frylock. I wonder if the minor modification to the 903, which you attributed to a slight wrist flexion at the beginning of upstrokes and slight extension at the end of downstrokes, is actually instead caused by a slight amount of forearm rotation. Either way I suspect this minor modification to the 903 and the supination of the forearm would be what is causing the escaped up pick strokes and trapped down pick strokes. [EDIT] I should add that the strange noise of the string is b/cos I have the phone lightly resting on the strings as I’m holding it in position with my left hand - no magnet unfortunately. When you attempt escaped upstrokes with a 903 or 902 movement, if the upstrokes aren’t escaping with the “9 o’clock” movement then your posture isn’t supinated enough. The essence of escaped upstrokes is that the pick gets closer to the face of the guitar on downstrokes (trapped direction) and further from the face of the guitar on upstrokes (escaped direction). It seems that the heart of your difficulty with wrist-oriented escaped-upstroke picking is that the movement of your pick is too close to “parallel” to the face of the guitar, hence strokes trapped in both directions. For an example of the kind of path that can work, take another look at @shinjuku 's video. Alternatively, if you want to explore a more forearm-rotation based approach (as in your second video), I think the key is finding a way to get the rotation motion to feel smooth even without holding the guitar or the pick. For me, one way to get that motion to feel smooth is to flex the wrist more. Even if you don’t want to have a gypsy-jazz type of wrist flex in your playing, experimenting with it can help you latch on to what a smooth forearm rotation can feel like, and give you a starting point for developing a forearm rotation motion with a posture that’s acceptable to you. Another thing that I personally find helps me have a smooth/fast powerful forearm rotation mechanic is using an “ulnar deviation offset” with the flexed wrist (in addition to being flexed, my wrist is deviated toward the ulna side).